Tired of Dirty Spas and Corners? Some common question swimming pool owners ask about their swimming pool/spa is “What is an easy way to clean the spa?” or ” My pool cleaner does a good job but it always misses the steps or one particular corner, is there an easy way to clean it? Well we have the answer! 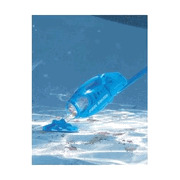 Swim Clear Pool Supply brings you a portable easy to use option for cleaning the pool. The lightweight, powerful Pool Buster is the world’s first and only rechargeable, Battery Powered, Self Contained Underwater Super Pool Cleaner. Its state-of-the-art, design is truly the first new cleaning technology to come along in over 40 years. The powerful Pool Buster is far more than a hand-held, spot-cleaner.The Pool Buster can be hand held to clean easy to reach portions of your pool or spa, that automatic cleaners usually miss, such as steps. By quickly and easily snapping onto any telescopic pole you can reach areas of the pool like the floor in the deep end, walls, in and around ladders, corners and drains. It is a Total, All-Pool Cleaning System that easily and affordably makes cleaning an entire Pool, Spa, Hot Tub or Fountain a breeze.